As I have been telling everyone for the past week and a half, I am one of the finalists for Best Blog Post in the Petties for my story about Feral Cat Day. What I haven’t announced yet is who will get the $1000 prize money to if I win. There are three reasons for this: 1) I haven’t decided yet; 2) YOU are going to help me decide; and 3) I’m going to do a little something extra, inspired by the four-times-yearly Be the Change for Animals challenge. I have already begun work on narrowing down the field of rescues to choose from. I asked my Facebook fans for suggestions, reminding them that since my nominated post was about feral cats, I wanted to donate to an organization that did a lot to help ferals. I also got one suggestion emailed to me. The only other criteria was that the group needed to be a 501(c)3 charity, as designated in the rules set down by DogTime Media. I got a lot of great suggestions, and you will be voting on them in the poll on my right hand sidebar. Because I know it might be tough to choose just one, you can pick up to three. This CT-based group formed because of a dramatic increase in cats needing help. The founders have over a decade of experience in helping feral colonies. FeralCare, Inc. works with communities to Trap, Neuter and Return, holds spay/ neuter clinics and provides educational resources for feral colony management. They are hoping to establish a year-round spay/ neuter clinic. Although Best Friends itself is a huge organization, its Los Angeles group is small, and locally, it conducts TNR for thousands of cats in two LA communities. With those numbers, they are always finding injured cats needing medical attention and kittens that can be put up for adoption, so they could definitely use the extra funds. This Los Angeles group advocates on behalf of feral cats and navigates the complicated red tape of the city’s animal control and health departments to help the plight of ferals in this sprawling metropolis. They also work hands-on to Trap, Neuter and Return, and to date are responsible for over 75,000 spays and neuters. FoFF has been helping with colony management in southern Maine since 1992. They help a number of colonies with TNR, food and medical attention, and they also find barn homes for cats and socialize and adopt out kittens. Some of you may be familiar with this group via their Justice for Bow Facebook page — they are the ones helping Bow, the friendly Grand Rapids, MI stray who was shot with an arrow and almost died. The group offers TNR services for outdoor cat caregivers and has a limited adoption and foster program for friendly cats and kittens. These volunteers work to reduce the free-roaming cat population through TNR in the town of Beaufort, and lends humane traps anywhere in Carteret County. They also offer education and advice about free-roaming cats. The human of my blogging friends The Creek Cats works with them! It’s Meow or Never for Ferals, Inc. This Florida group advocates for ferals in Tallahassee and Leon counties through education and TNR assistance, and help colony caregivers with food expenses whenever it is appropriate. Their volunteers are very knowledgeable and helpful. Located in central Illinois, this no-kill, no-cage sanctuary has a program to help feral caregivers with food and TNR. It’s a wonderful rescue. Made up of over 60 volunteers, a part-time vet and seven board members, this Madison, WI organization offers no-cost and low-cost spay and neuter services for ferals, has a shelter and adoption services, helps the public with cat population issues, provides emergency vet care to Dane County cats and does everything it can to promote a no-kill standard in its community. Like so many other groups, PACT is working towards a no-kill goal and helps ferals through its CORE program. They offer the tools for suburban Chicago folks to TNR ferals, and work with communities and local officials as advocates for the area’s feral cats. This was a suggestion from my pal Cathy Keisha, and I’ll just tell you what she wrote to me: “Our favorite charity helps feral cats by taking them off the mean streets of Jersey City, getting them fixed and sending them to rehabilitation, aka a cat sanctuary, to get unferal.” The sanctuary is on four acres of land in Jonestown, PA. This group is working very hard to make a dent in the area’s stray and shelter population. This group of central New Jersey volunteers cares for several colonies in Hunterdon County, and finds homes for homeless adoptable cats and kittens. They do a lot of TNR in their area. This group works hard to TNR feral cats in the Pittsburgh area. They also do spay, neuter, rescue and fostering. So please make your three choices and vote for them at your right. Voting closes July 29 (the same day that voting for the Petties closes). 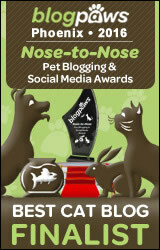 If I win the award at the BlogPaws conference on August 26, the two groups that got the most votes will split the $1000 award. But I have a surprise: the group that comes in number 3 will get a donation widget on my sidebar for the whole month of August! So no matter what, one of the groups above will be a winner! As a “ranchhand” for Forever Home Feline Ranch, I cannot give a higher recommendation than the mission taken on by Brenda Barton, Cheryl Johnston, and the rest of the dedicated board members and volunteers. Considering that Brenda is HIGHLY allergic to cats, she has without hesitation offered her home as the mainstay for the majority of the cats waiting for the Ranch to become a reality. I can think of no other person/persons who would believe in their mission so strongly, and I am proud to help in any way I can make this move forward. I am voting for FHFR every day!!! Big Baby and Little BooBoo are casting their votes from heaven, as they were both called up so suddenly Saturday before last. They were loved so much and played such a big roll at Brawny Cat. Although they had many friends in many shelters around the country, their favorite shelter was Cheryl Johnston’s Forever Home Feline Ranch. Thanks Cheryl – for doing what you do. Hey, that’s pretty neat. Each of the top 3 would be a winner. A kind and generous idea. Sparkle, All thses groups so deserve the help. We are going to let YOU choose 🙂 I am voting for you every day!! This is a tough decision since all of these charities do such good work for animals I am going to purruse their website before casting my vote. Sparkle I voted again for the Petties and hope you win. I think your idea is SUPERB! It IS hard to decide who is worthy of the prize and the fact that you involved us, your readers is to be commended! I am THRILLED to see Carol’s Ferals on the list. They are in Michigan (as I am) and I have featured them on my blog. They do some super creative fundraising as well. We have voted in your poll and voted for you again. I hope people will consider voting for A Call 4 Paws because it’s a very small 2 person (Mother & son) operation that does a lot to cut down our local feral population and find homes for the ones they can socialize. They don’t have many ways to fund raise so any $$ they can get will be put to good use spaying/neutering both dogs & cats and with the upkeep of their sanctuary. I voted! Really hope you win, Sparkle. Good luck to you, Sparkle Cat! For the sake of all those rescues, I hope you win! Small, local groups need help more than anybody. Your choices are wonderful. One of my votes goes to Animal Advocates that’s for sure! I’m from the area and there are simply not enough TNR programs locally to curb the feral cat population. Individuals are left to either deal with the burden of trapping, getting spayed/neutered, and re-releasing (since many people realize the benefits of non-reproducing feral cats)… they have to pay all the costs and finding people willing to do this are few and far between…some may take the time to rent a trap or somehow capture the cat and turn it into the shelter (where it would be euthanized)…but unfortunately most either poison or otherwise get rid of the feral cats. Thanks for taking the time to find out small local groups who need the funds to do important work! I will go and pick now. You are wonderful Sparkle. I have been voting 2x a day for you so I hope you win! I was happy to vote friend. I was most excited to see one listed form our state. I don’t think it has a wing and a prayer of winning, but it was fun to see it here. Yep, that’s tough, but I voted! Voting for you for the Petties isn’t tough at all though! That was tough to pick just three because they are all deserving! We hope you win Sparkle and we’ve certainly been voting for you! It would be tough to narrow that list down to three. We hope you do win, Sparkle–we’ve been voting for you! I think it’s wonderful there are so many organizations that help the feral cats! Good luck, hope you win! This is so great. 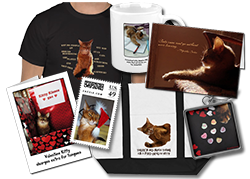 I am so glad you are a fan of helping the feral kitties. Those all look like great choices but I sure hope Dana’s gets in there. They work so hard and do such a great job. That would be Beaufort Community Cat Project. Thanks a bunch for doing this. Sure hope you win. Sparkle, all these groups are so deserving! It’s gonna be hard to choose 3!! We agree with Rumbles that they all sound great. But we really like the look of Forever Home Feline Ranch. I was like wow, everyone agrees with my choices, then I noticed I was only seeing my votes, mol . . . So good of you to do this! What a lovely thing you’re doing my dear, any of those charities would be very deserving!